(Phys.org) -- The first bio-inspired microrobot capable of not just walking on water like the water strider  but continuously jumping up and down like a real water strider  now is a reality. 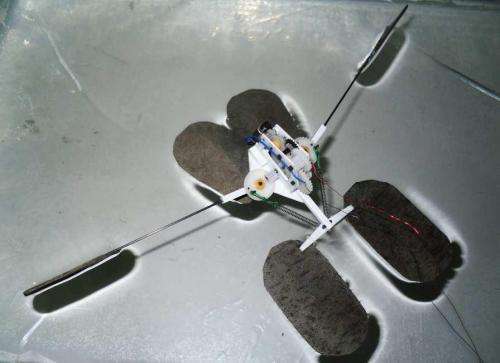 Scientists reported development of the agile microrobot, which could use its jumping ability to avoid obstacles on reconnaissance or other missions, in ACS Applied Materials & Interfaces. Qinmin Pan and colleagues explain that scientists have reported a number of advances toward tiny robots that can walk on water. Such robots could skim across lakes and other bodies of water to monitor water quality or act as tiny spies. However, even the most advanced designs  including one from Pans team last year  can only walk on water. Pan notes that real water striders actually leap. Making a jumping robot is difficult because the downward force needed to propel it into the air usually pushes the legs through the waters surface. Pans group looked for novel mechanisms and materials to build a true water-striding robot. Using porous, super water-repellant nickel foam to fabricate the three supporting and two jumping legs, the group made a robot that could leap more than 5.5 inches, despite weighing as much as 1,100 water striders. In experiments, the robot could jump nearly 14 inches forward  more than twice its own length  leaving the water at about 3.6 miles per hour. The authors report that the ability to leap will make the bio-inspired microrobot more agile and better able to avoid obstacles it encounters on the waters surface. This study reported for the first time a novel microrobot that could continuously jump on the water surface without sinking, imitating the excellent aquatic locomotive behaviors of a water strider. The robot consisted of three supporting legs and two actuating legs made from superhydrophobic nickel foam and a driving system that included a miniature direct-current motor and a reduction gear unit. In spite of weighing 11 g, the microrobot jumped 14 cm high and 35 cm long at each leap. In order to better understand the jumping mechanism on the water surface, the variation of forces exerted on the supporting legs was carefully analyzed and calculated based on numerical models and computational simulations. Results demonstrated that superhydrophobicity was crucial for increasing the upward force of the supporting legs and reducing the energy consumption in the process of jumping. Although bionic microrobots mimicking the horizontal skating motions of aquatic insects have been fabricated in the past years, few studies reported a miniature robot capable of continuously jumping on the water surface as agile as a real water strider. Therefore, the present finding not only offers a possibility for vividly imitating and better understanding the amazing water-jumping capability of aquatic insects but also extends the application of porous and superhydrophobic materials to advanced robotic systems. If scaled up to human-carrying size, this is exactly the vehicle technology I've been looking for. I look at the rivers that divide cities with congested traffic, over-crowded public transportation and general lack of fun as untapped routes. You jump on this, hopefully lightweight contraption, and hop across the river, channel, bay, or other narrow waterway in a fraction of the time. The boss says, "Henderson, whatever you're doing to get here on time, keep it up!" Unfortunately water striders only work on relatively still bodies of water. If scaled up to human-carrying size, this is exactly the vehicle technology I've been looking for. I dunno. Seems this would only be great for the (very) few people who live and work on opposite shores of a lake. From an insect's perspective, a small ripple in the water may seem like a tsunami, but to an average-sized human on a craft scaled to his size, the ripples are easily managed as well as wakes and other surface disturbances. I have some experience on a major river in a hovercraft of my making. Also, think of the oars of a rowboat or kayak- no different than a water strider's configuration. Actually one video is attached to ACS article above linked.